In September last year, 2017, the Hemsley family took our yearly excursion into the hills. 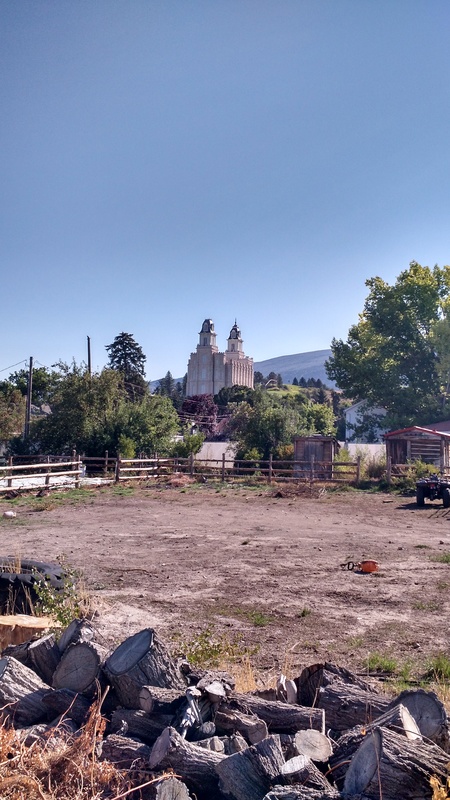 We traveled into Soda Springs to get to know the town and its sites a little better. 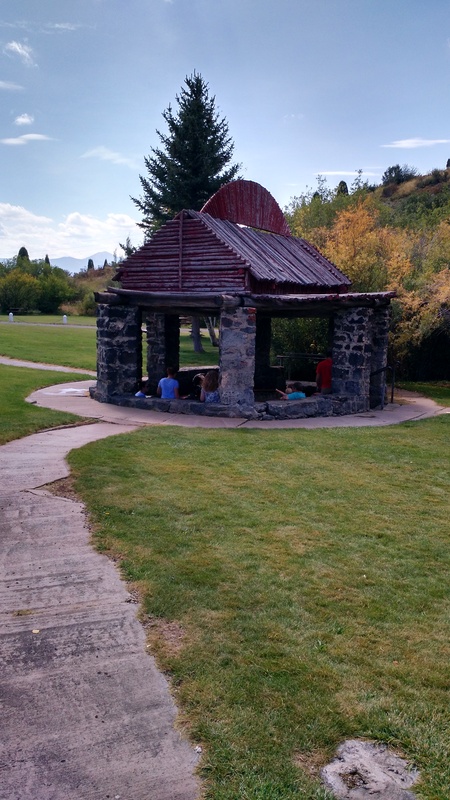 We made a trip to Hooper Springs Park north of Soda Springs to see what we could see. A memory stretching from my childhood appeared. I remember going here with my Grandma when I was about 5 or 6 years old when I would go with her selling insurance for a week or so at a time. I remember this little park and the gazebo covering the spring. We brought our cups out and we did partake of the carbonated waters from Hooper Springs. I did a little research on Hooper Springs. This little spring has been here and advertised for over at least 160 years. Rain service reached the area in 1882 and W. H. Hooper marketed the springs nationally. 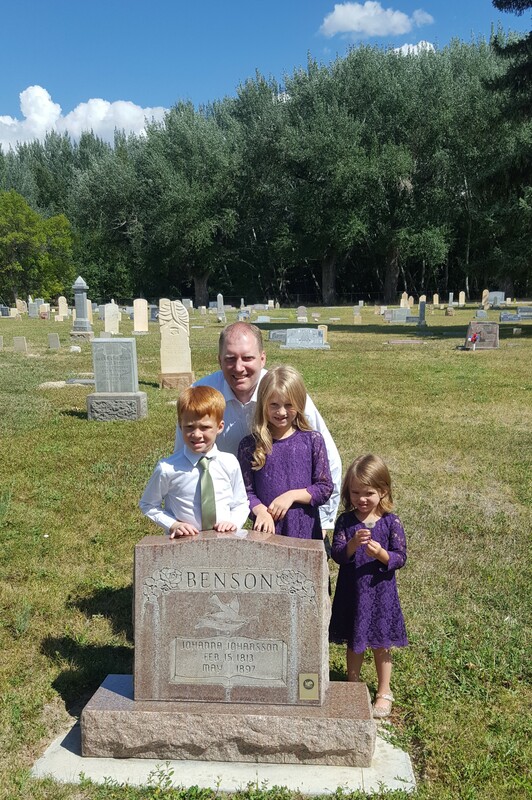 Hooper was a banker and President of Zions Cooperative Mercantile Institution. He was a great advocate of Soda Springs and the soda water industry. 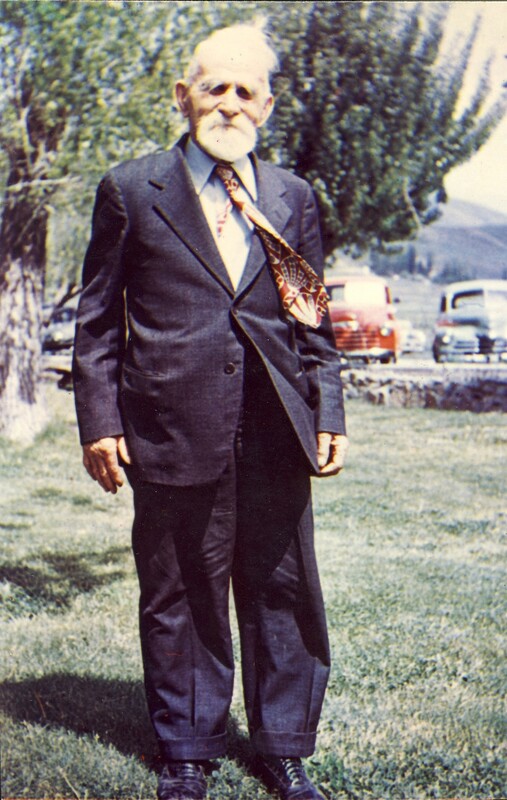 William Henry Hooper was born in Maryland, moved to Illinois, converted to Mormonism, and moved to Utah with the exodus. He served in Congress from Utah from 1859 to 1873 with some gaps. He was superintendent of ZCMI from 1873 until 1877, then as President from 1877 to 1882. He was also the President of Deseret Bank from 1872 until 1882. Hooper first came to Soda Springs about 1870. 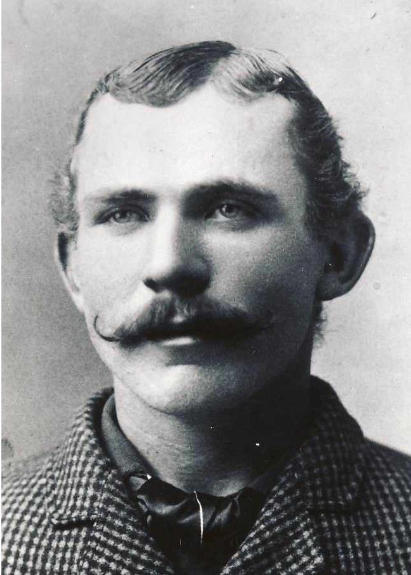 He had his own home in Soda Springs as well as Salt Lake City. Here we came into Hooper Springs in September 2017. Photo of the Hemsley clan to prove our attendance. James Ross sits int he car seat on the bench, Zach Smart and Alyssa Hemsley in the back right, Bryan Hemsley holding the red solo cup with flavored carbonated water, Jill Hemsley, Amanda Ross, Derek & Jordan Hemsley holding Jack, with children Alyssa Ross, Lillian Ross, Olivia Hemsley, and Hiram Ross in front. Old Main at Utah State Agricultural College (USU now), Logan, Utah, about 1900. The iconic front and tower were build in 1902. Fred Nuffer provided 3,000 feet of cut stone for the construction of the south wing. From Utah State’s Facility Planning. “Old Main is the landmark of Utah State University and remains the oldest academic building still in use in the state of Utah. In 1889, plans for “The College Building” by C. L. Thompson were selected by the Board of Trustees just two weeks after the land for the Logan campus was secured. The site was chosen the next day so that the main tower would be due east of the end of Logan’s Seventh Street —Today’s Fifth North. Construction began immediately on the south wing of the three -part building and was completed in 1890. “With more money appropriated in 1892 than anticipated, the Trustees hired [K]arl C. Schaub to redesign an enlarged structure and the construction began for the east part of the central section and the north wing. It wasn’t until 1901 that the money was assured for the completion of the building. The front portion along with the tower was completed in 1902 with the design of H. H. Mahler. Fred Nuffer provided his own contribution to the construction of the south wing of Utah State’s Old Main. Another interesting side link, Karl Conrad Schaub’s widowed mother married Fred’s father, John Christoph Nuffer. She was Anna Maria Alker who married him Conrad Schaub who left her widowed in 1894. Fred Nuffer provided stone, Karl provided design. Karl and Fred’s brother, John were friends and worked on buildings together. Utah State was founded in 1888. It appears that the cornerstone was opened at 50 years in 1938 and a new cornerstone was sealed to be opened in 1988. As Fred Nuffer was involved with some of the construction of the campus, he was requested to write for the cornerstone. This was the original part of Old Main, south wing, of what is now Utah State University in Logan, Utah. 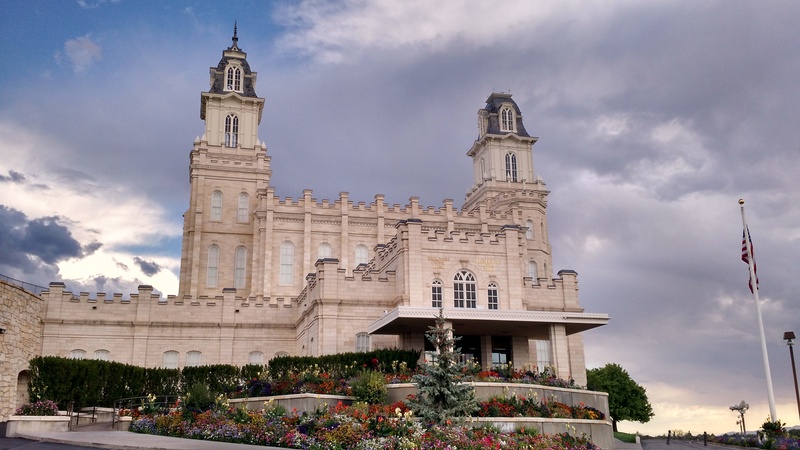 “I will recount in detail, as I remember it, the work done by myself and others in supplying stone for the construction of the Utah State Agricultural College buildings in Logan, Utah. “In the year of 1891-1892, I made contract with Mr. Venables of Ogden to deliver about 3,000 cubic feet of cut stone. Mr. Venables had previously tried to get the stone somewhere south of the valley, but found the stone unsuitable, and the party could not fill the order. As I had furnished stone for several buildings in Logan, Mr. Venables came up to see me. I lived near the quarry at that time. He inspected the quarry and pronounced the stone suitable and gave me a contract to fill the order. The quarry was located about ten miles up Cub River Canyon from Franklin, Idaho, on the left side slope going up the river, on a small tributary creek of Cub River called Sheep Creek. “All work was done by hand. The main ledge was about 20 feet above ground and about 20 feet wide and 400 to 500 feet long. We used 12 foot churn drills and blasted large black loose from the main ledge. We had to be careful how much powder we used so as not to shatter or cause seams in the stone. We usually had to put a second charge in the opening made by the first charge to dislodge the block from the main ledge. The block so dislodged was from 6 to 7 feet thick and about 20 feet long. From then on, all tools used were hammers, axes, wedges, and squares. Grooves were cut with axes wherever we desired to split the block, then wedges were set in the grooves about ten inches apart and driven in with hammers. Then we dressed them down to the right measurement allowing one half inch for the stone cutters to take out all the tool marks we made. Mr. Venables furnished bills for stone in dimension sizes as needed in the building. “My brother, C[harles]. A[ugust]. Nuffer, worked on the job the whole time it lasted. I also had a man by the name of Ed Hollingsworth of Preston, also Mr. A. Merrill and Mr. Abel Smart of Cub River, and Mr. Robert Weber of Providence. “It took part of two years for the job, 1891-1892. The hauling was all done with wagons and horses: 30 to 35 cubic feet was a good load for two horses. The following names were the men doing the hauling: John McDonald of Smithfield, Jean Weber of Providence, and Jake Rinderknecht of Providence hauled more than any other. He used to leave home at 3 a.m., load up the same day and get back to Logan by 3 p.m. the next day. It was very hard on the horses. I also hauled a good many loads with my own team. All loading was done by hand on skids. “I got 40¢ per cubic foot, of which 20¢ was paid for hauling. We had a hard time handling the name stone to go on the front of the building. When it was ordered it had 30 cubic feet in it and only one foot thick. When the stonecutters got through with it they had found it too big to be hoisted in place so they made it smaller until there wasn’t much left. 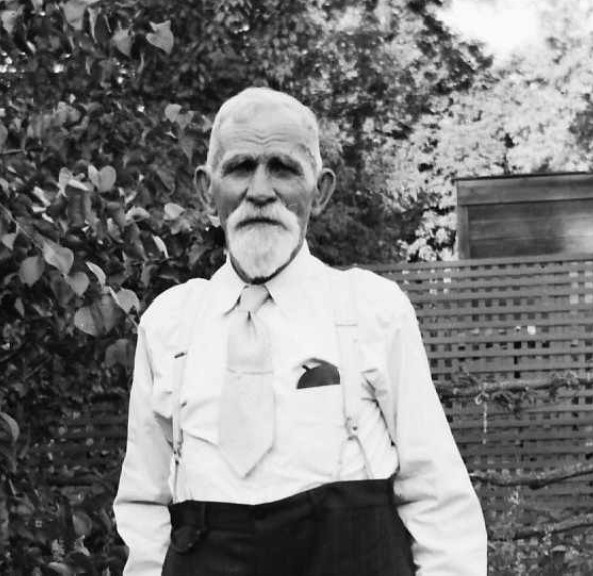 “The most difficulty I had was in not getting my pay from Mr. Venables. We overlooked a large 4-horse load at the final settlement. A few minutes after I had signed the receipt for the final payment in full I discovered my mistake. Mr. Venables refused to pay for it, although I produced the bill of lading signed by him. He didn’t dispute the debt, but said he had a receipt paid in full. He didn’t have anything, and the government property couldn’t be attached, so I was the loser of about $15, which seemed a lot of money to me at that time. 2017 is now ending. Where in the world has it gone? Here is a photo that I think more or less sums up the entire year. Hiram, Lillian, Amanda, Paul, James, and Aliza Ross in 2017! Ms. Brandi Teuscher took that photo and deserves the credit. She had some difficult subjects to work with under the circumstances. A 1956 Dodge Coronet with plenty of blemishes due to age. She turned 61 this year. Hopefully we can get her better looking in the future. 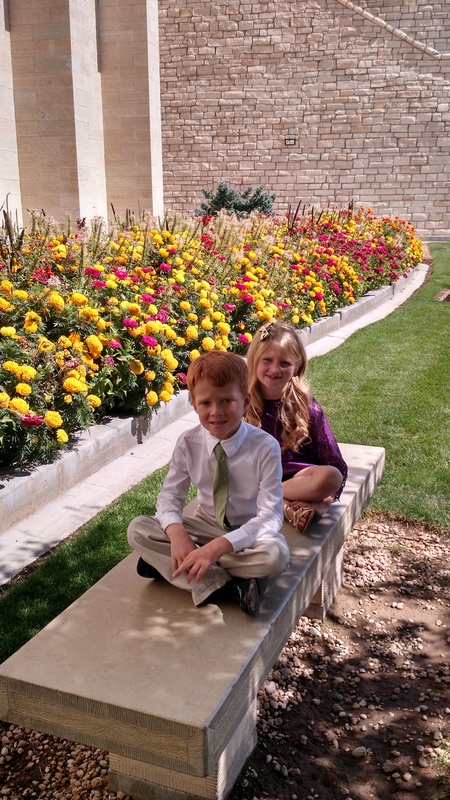 One of my favorite things in the photo, beyond the family and car, are the dandelions. They make my heart happy. Aliza turned 7, Hiram turned 5, Lillie turned 2, and James was born in March. Amanda and I continue to mature in age and demeanor. Our little family continues to grow. 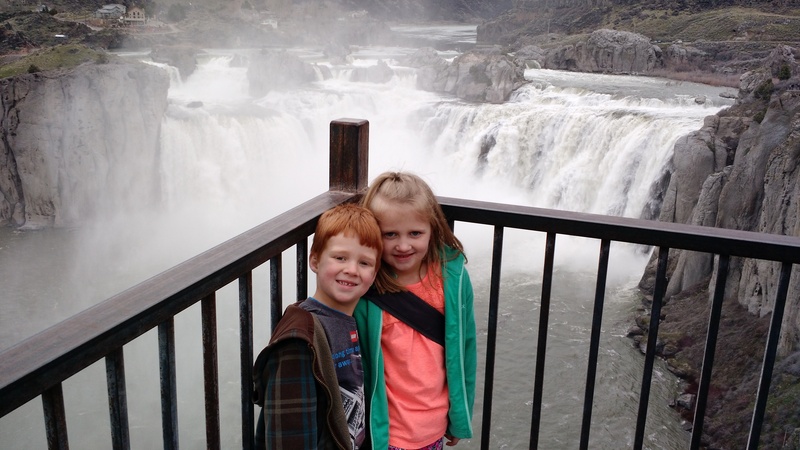 In March we saw the raging Snake River over Shoshone Falls. 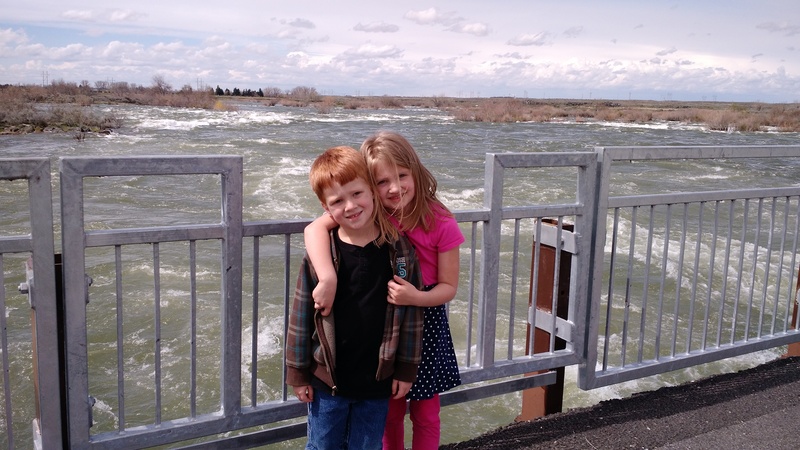 In April, the Snake River continued to rage so we took a picture at Minidoka Dam. 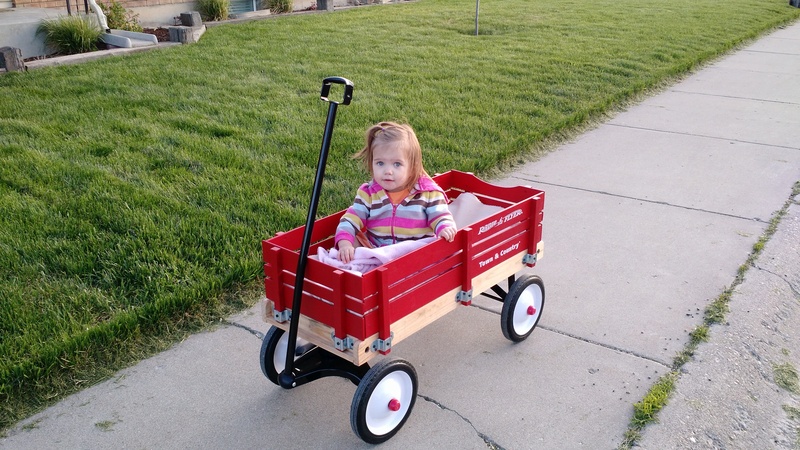 Our grass greened up and was beautiful and the kids enjoyed a new Radio Flyer wagon. 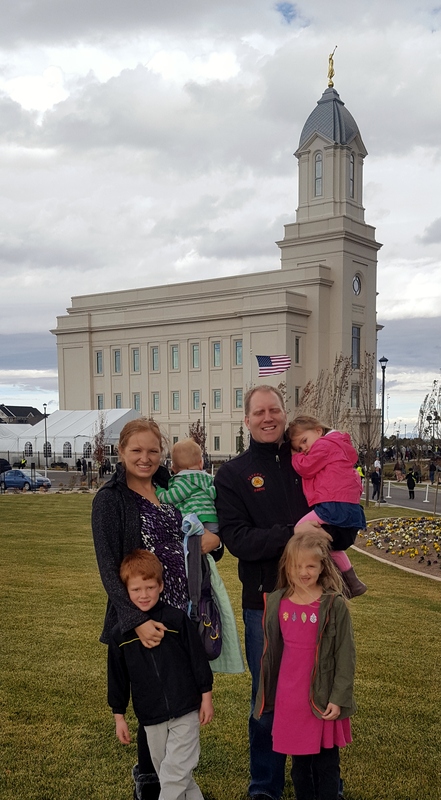 We attended the Open House and Rededication of the Idaho Falls Temple. 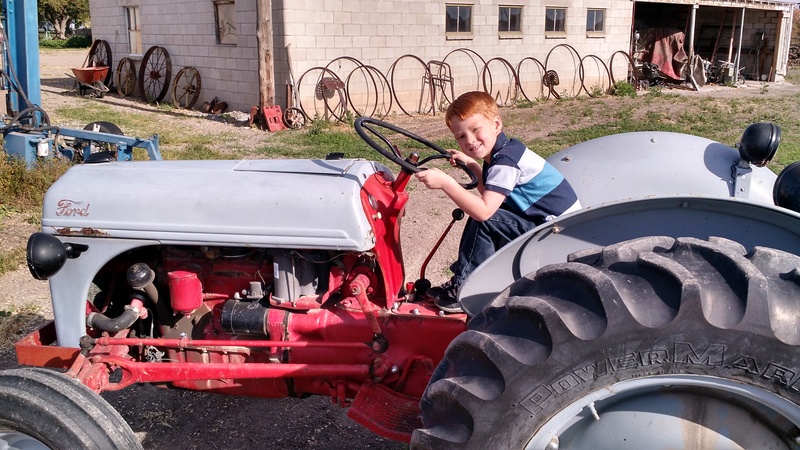 Hiram was antsy to start farming in June. 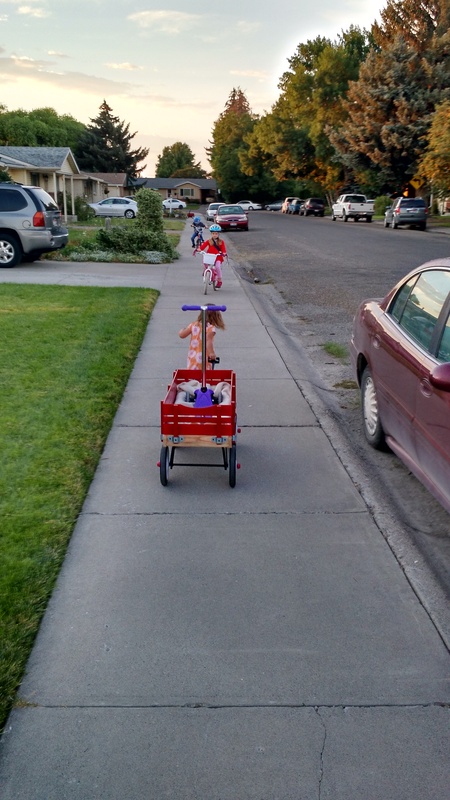 During most of the summer, the kids loved to go for walks or bike rides in the evening. 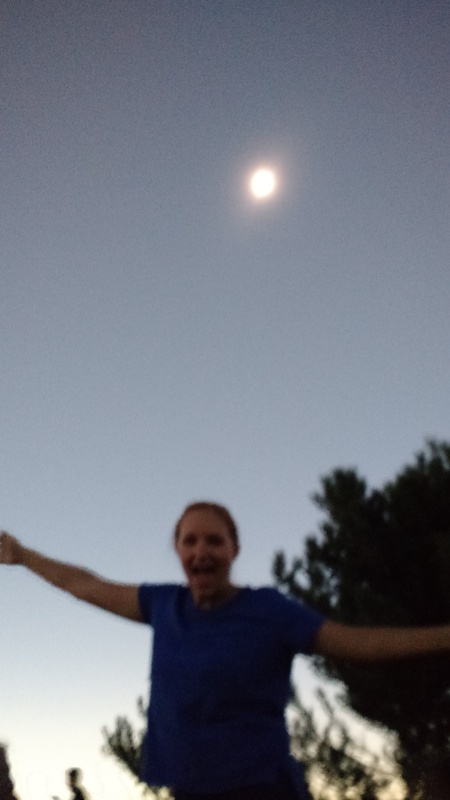 We traveled to Rexburg for the 2017 Great American Eclipse! 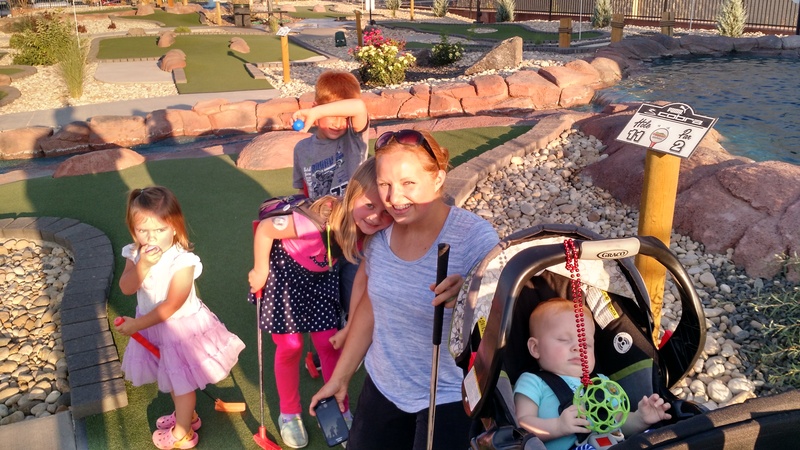 We enjoyed some hot miniture golfing in Twin Falls in September. 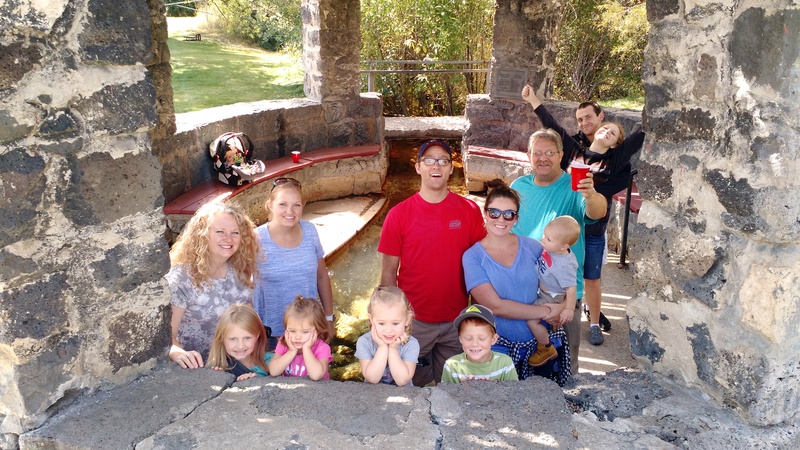 The Annual Hemsley Camp Out also took place in September in Soda Springs. We not only enjoyed the carbonated springs, we felt a few earthquakes too. 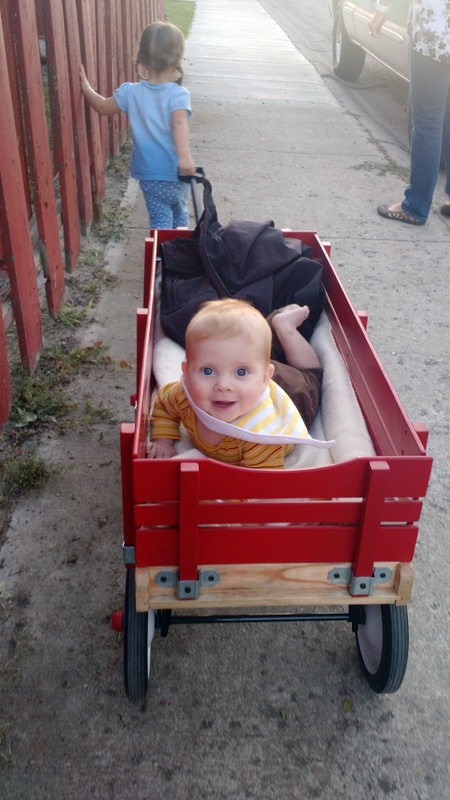 James grew up enough to look around, crawl, and Lillie grew enough to pull him in a wagon by September. Made a trip to Cedar City for the Cedar City Open House by November. Paul, Amanda, Aliza, Hiram, Lillian, and James Ross with Jill Hemsley recreating a 1939 photo of David and Dave Donaldson. What shall 2018 bring with it? I find myself echoing Jacob. “And it came to pass that I, Paul, began to be old… the time passed away with us, and also our lives passed away like as it were unto us a dream.” It passes too quickly. We could make more memories, but health and money are limited. Hopefully more memories and life in the upcoming year. 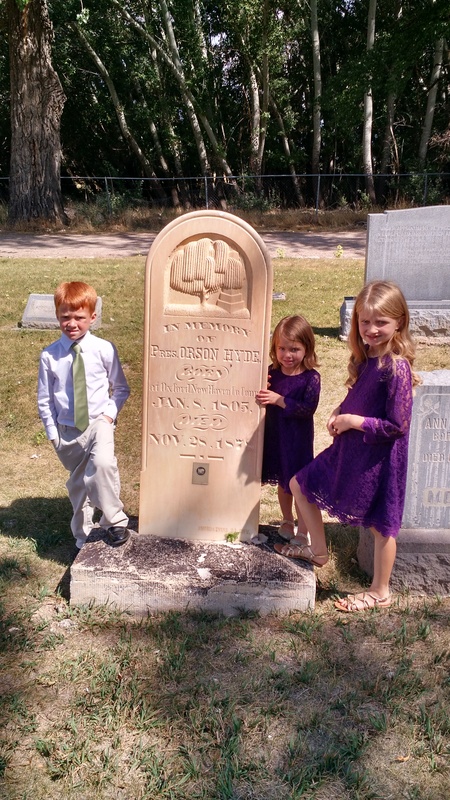 “Louisa Zollinger was born 24 January 1864, at Providence, Utah, the daughter of Ferdinand Zollinger and Louisa Meyer. 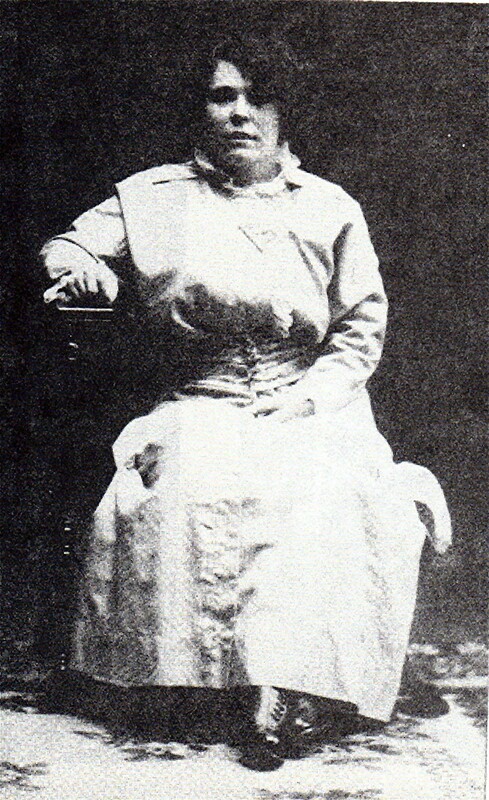 She was the eldest of five children, her brothers and sisters being Ferdinand (born 24 January 1866), Bertha (born 3 August 1867), Mary Elizabeth (born 3 March 1870), and Sarah (born 26 July 1875). Two children died in infancy. 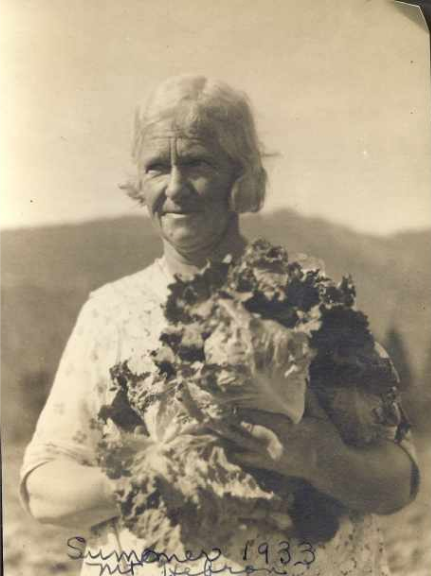 “Living in a pioneer community, Louisa was subjected to all the hardships and trials of her day. She has related many incidents concerning Indians in the early days of Providence. She received her education in the district school, having gone through the 8th reader. “Louisa loved to sew, and before she was fifteen she took a dressmaking course from a lady by the name of Maggie Hyrion. She learned to cut patterns to fit them to a model. “She was a very spirited and independent girl, and being the eldest she enjoyed telling her brother and sisters what to do. She did what she could to help with making a living. When she was fifteen she worked for a time in the Blanchard Hotel in Logan. One summer she spent working at the Box Elder dairy at two dollars per week. She helped milk eighteen to twenty cows. The next summer she worked at a Logan dairy where she helped with the milking and cheese making. “Louisa was quite popular with the young people and attended the dances in the community. One dress she used to wear is still remembered by her sister Mary. A seamstress came to the home and remained one week to sew the dress, which was of black wool trimmed with heavy black satin. The young crowd also enjoyed house parties, candy pulls, and sleight (sic) riding parties. 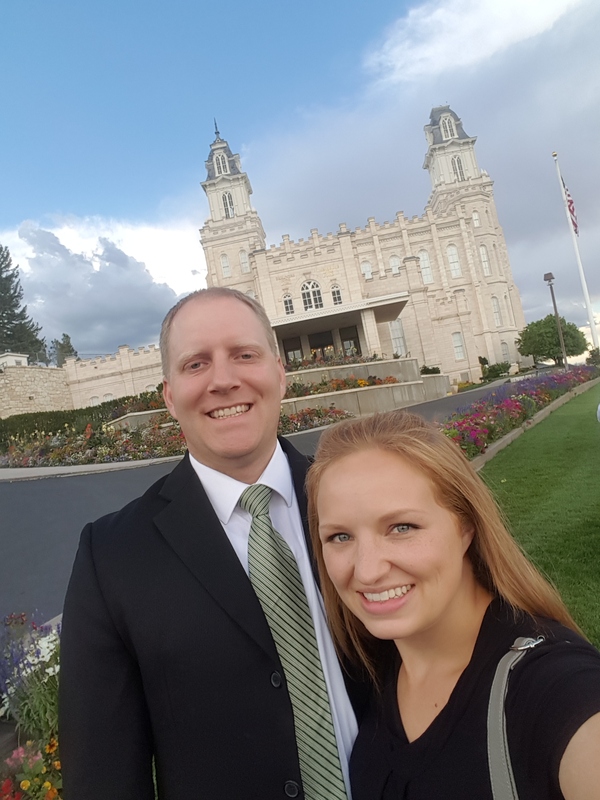 “September 18, 1884, she was married to .John Nuffer at Providence, Utah, and they were sealed in the Logan Temple 15 July 1891. 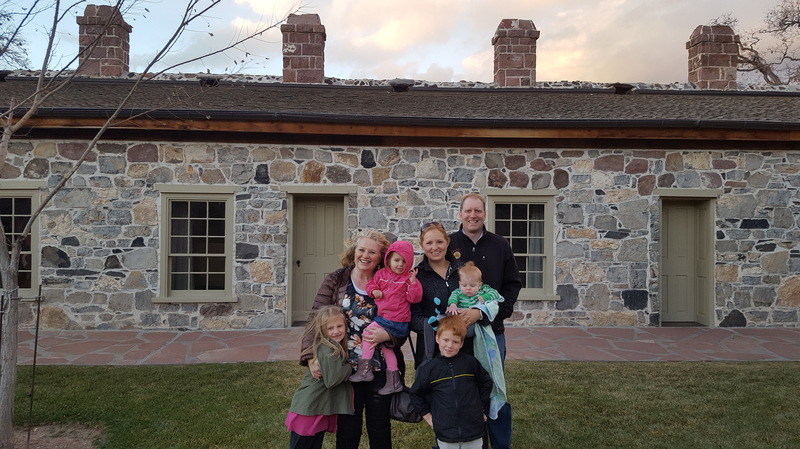 They then moved to Glendale, Idaho, where her husband had homesteaded and built a small rock house. Here she made a home for her beautiful flowers. Snakes were very numerous, and she often told how she would send the dog into the garden first to flush out the snakes before she went into pick vegetables. “She returned to her mother’s home at Providence for the birth of her first son, Luther Jacob. Her next two sons, John Willard and Louis Ferdinand, were born at Glendale. “In the fall of 1890 the family moved to Preston, where her husband had been called by the Church to take charge and superintend the building of the Oneida Stake Academy. They rented a home on State Street for about one year until John could get a home built for them, which was a four room frame house. Two more sons were born here, Herman Christopher and Austin Eckertt. 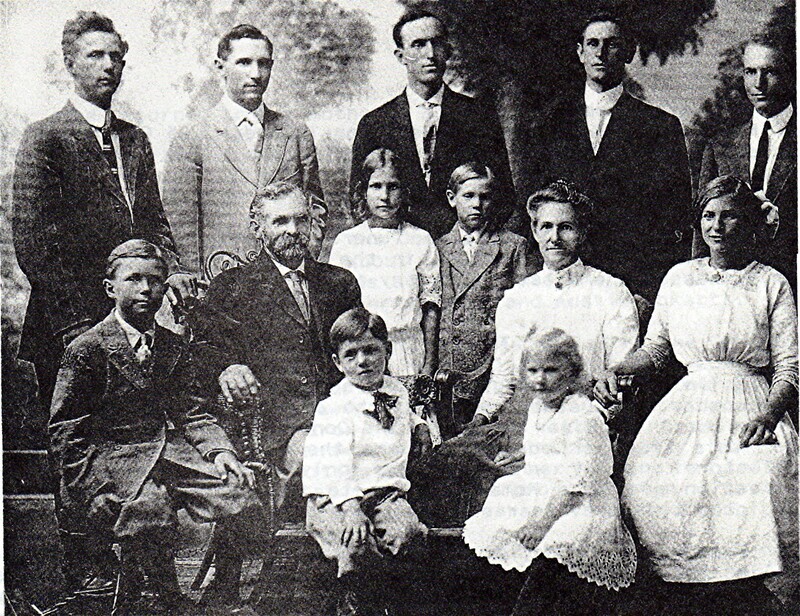 “In the spring of 1895 her husband was called by the Church to go on a mission to Germany, his native land. 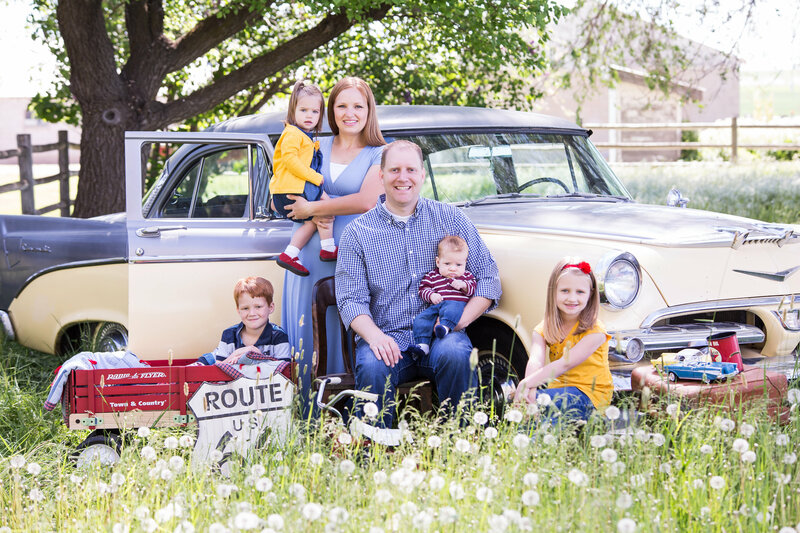 Although Louisa had five small sons and was expecting another child, she encouraged him to fulfill the call. A few months after her husband’s departure, her sixth son, Karl Aaron, was born. Louisa accepted her responsibilities gladly and cared for her little family. They did not suffer for the necessities of life, as her husband had left her provided for, and they had two cows to provided (sic) them with milk. She was also able to knit and sew for herself and children. “Following her husband’s return her first daughter, Agnes Louisa, was born. Shortly thereafter John built a larger house of rock for his family. Myron David, Florence Myrtle, Edwin Joseph, and Athene Barbara were born in this home. Louisa also raised her grandson Karl Luther, following the death of his mother [Luther’s son]. “Two more lovely homes were built for her by her husband, one a red brick and the other a cement block, where she lived until her death. “Louisa was very active in the Relief Society, and served as a visiting teacher for many years. She was very outspoken in defending the things she believed in. She encouraged her children to seek a higher education. 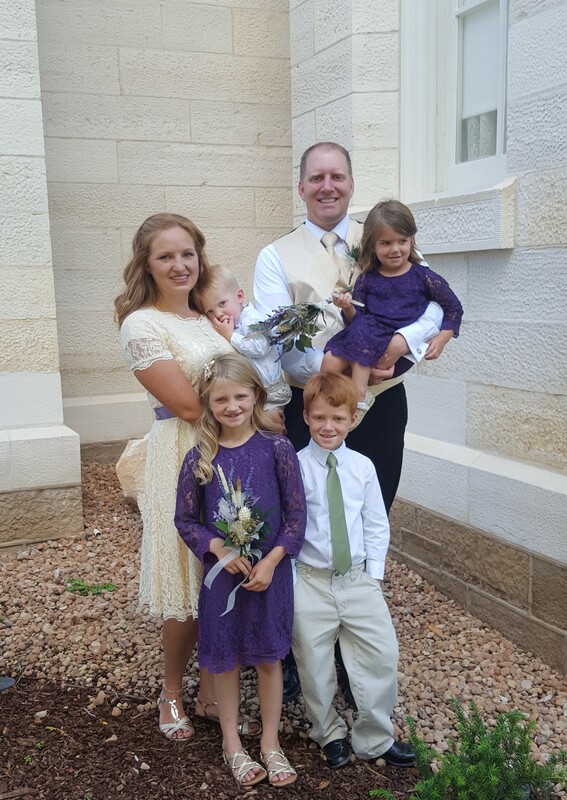 Seen have attended college, two have fulfilled missions, one son has served as a bishop of his ward, and all her children have gladly accepted positions in the various auxiliaries of the church. “She taught her children industry and thrift. She was generous in giving to the poor, and at the same time gave encouragement to all to better their lot. She was a good cook and neat housekeeper, and her love of sewing was evidenced in the living clothes she made for herself and children. 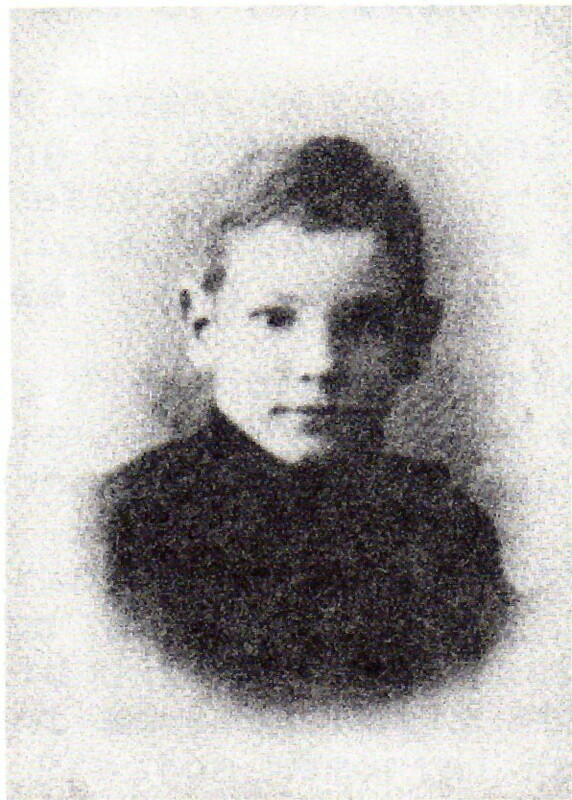 “The first great sorrow in her life was the death of her son, Karl Aaron on 7 February 1905, at the age of ten years. Herman Christopher died 23 August 1940, and Austin Eckertt 2 March 1944. “During the latter part of her life her health was very poor, but with a strong will and determination she carried on her household duties. Her last illness (cancer) was very painful, and she spent several weeks at the L.D.S. 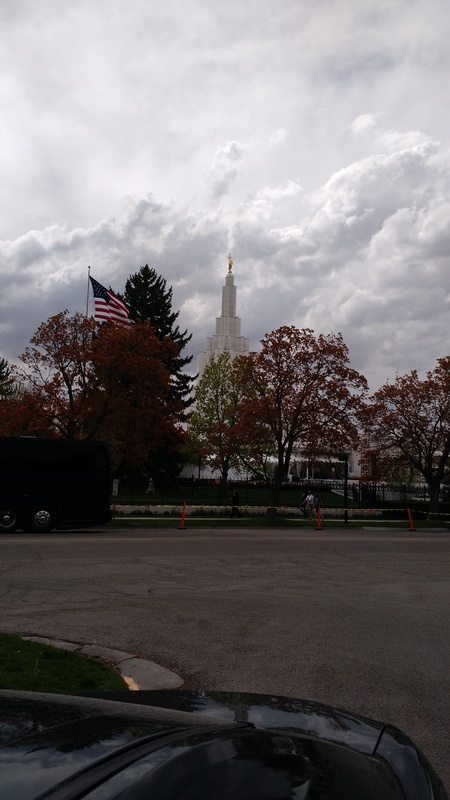 Hospital in Salt Lake City, and the Preston Memorial Hospital in Preston. She was released to her home few days before her death on Thursday, 25 October 1945. Besides her husband she was survived by eight of her children, all whom were at her bedside, also 30 grandchildren, and 22 great grandchildren. “Beautiful and impressive funeral services were held the following Monday at 2 o’clock in the Preston First Ward Chapel. Burial was in the Preston Cemetery on 29 October 1945. “Zollo was an old Teutonic name appearing in documents of the 9th century. The story goes that the Zollingers operating a ferry across the Rhine River near the Lake Constance and charged a toll. From this trade or occupation came the name Zoll, meaning toll collectors. They were not the only ones engaged in this profession, for the Romans, prior to this time, had officials appointed to supervise river traffic and collect tolls. “Farmers by trade, the Zollingers called their settlements Zollinc-hoven, meaning the farms of the Zolling clan. In that day Zollic-hoven was the name of two different places, Zollikon and Zollikofen. The present cities, Zollikon near Zurich and Zollikofen near Bern are ample evidences of the settlements and estates once occupied by the Zollingers centuries ago. “In a manuscript appearing in the periodical of the Swiss Genealogical Society “Der Schweizer Sammler und Familienforscher” in 1935, page 57-58 and 84-85, is an essay with the title “Uber Namesforschung: Der name Zollinger”. Its author, Gustav Zollinger, Dr. Dentist and member of the Swiss Genealogical Society brings to light in a very comprehensive way, the history and movements of our people in their many places and occupations, from which has evolved the name Zollinger in its many variable spellings. His work is well documented with sources from court, land, census, death, parish, and tithing records.